Do you all know that song by The Commadores, Brick House? The Husband is a total clown, seriously! 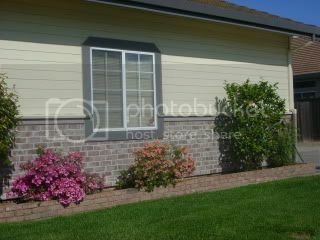 We picked out Nichia siding for our house to put on our front to frame our new round cement steps and do a wall border. We received samples from the rep this week and he was walking around the house singing this song WITH the samples. I snapped a few pictures of my “Brick House”…..LOVE him! He is such a clown! Actually, here is a picture that the super cool sales rep sent us of an example using the style and color of fiber cement brick we are using. 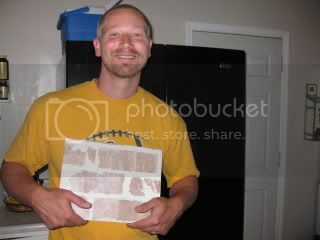 This isn’t a picture of our house, but, this is one of the ways we plan on using the brick. Doesn’t it look cool? I cannot wait to install it and show you all how cool it looks! Tonight we decided to have a little fun. We stopped by so I could buy some lotto tickets for tonight and tomorrow before heading out to one of The Husband’s favorite places, M&S Tasty. I figured I’d let him choose since he has been a trooper Bikini Bootcamping it with me. 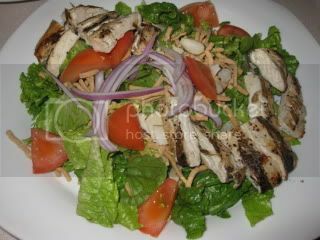 I picked a Grilled Chicken Salad with Thai Peanut dressing on the side. Tomorrow I am heading out in the morning to my WW meeting for another backwards weigh in. Then, we are off to help our friends install their laminate flooring. I will be back tomorrow night with a full recap of my day if I don’t make it back during the day. I STILL plan on sticking to my Bikini Bootcamp Routine Morning Burst, BBC breakfast, Salad for lunch and BBC snacks and dinner. 2 days to go…….Woohoo! Have an awesome Saturday and enjoy whatever you all are doing. See you later! That movie sounds right up our alley; the hubs and I loved Superbad! Good luck with your WI and I can't wait to hear about your BBC results – I can't believe you only have 2 days left – awesome! My guy friends wouldn't stop quoting The Hangover last night! They are OBSESSED. baha you and your guy are so fun =)! i have got to see the hangover asappppp – all my friends have seen it and say it's hysterical! Haha your husband is funny! That siding looks really cool–I can't wait to see it on your house. You're doing so well with the challenge! And I so need to see The Hangover. I keep hearing such good things! 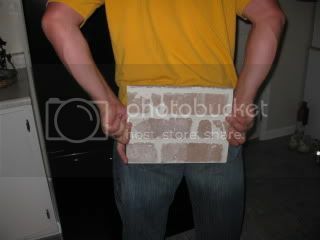 ahaha.. brick house! i love it! the booty shot cracks me up! LOVED the hangover! it is so bad and so good! have fun at the meetiing, are you guys going to try all the chips?! I love seeing all of your house changes. So much fun! Dinner and a movie…perfect date night! I'm off to do Circuit Training now while Little One takes a nap! Marisa ~ He is a total clown. The Hangover is a so good. WI is tomorrow – I cannot wait! K ~ OMG The Husband is doing the same thing with that movie 🙂 It must be a guy thing – funny! Michele ~ Thanks – it's finally all coming together after spending a few years redoing it all. It's exciting to finally see an end in place. Jenny ~ Yup – he has a great sense of humor that always keeps things interesting. You definitely have to see the Hangover – it's great! Angelea ~ That is a great story – I'll have to remember that one!